With the year-on-year rises and the introduction of the new National Living Wage, 2016 promises to be an eventful year for the care sector. The government did provide some financial support for the sector in the recent Autumn Statement, but the Chancellor failed to deliver the additional funding the sector is in desperate need of. The main focus in the lead up to the 2016 Budget for care homes was indeed additional funding and how much, if at all, would be promised by the government. 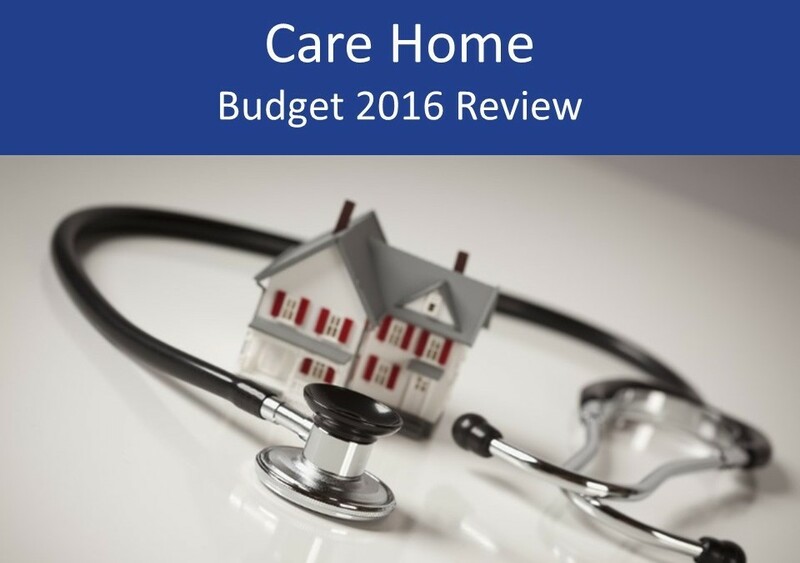 In this care home 2016 Budget review we summarise the key points and developments arising from the 2016 Budget and focus specifically on what the changes may mean for the care sector. Whilst many small businesses will have welcomed the news to overhaul the business rate relief, it could have a long-term consequence for the care sector. The Chancellor announced that the business rate relief for small businesses will more than double from £6,000 to £15,000, which is positive news for the business community. However, looking at the implications for the care sector, the changes may leave councils to once again brace themselves for more cuts. Estimates suggest that this will take £7bn out of the total business rate take in England over the next five years. Councils have already been subject to considerable funding cuts in recent years and the knock-on effect of this latest change could see councils hold or even decrease their fee levels paid to care homes. Local councils may be compensated for their loss of business rates, but the details behind this are not likely to be announced for some time. Following last year’s reform of residential stamp duty, the Chancellor announced that commercial stamp duty will be reduced with a zero threshold for commercial properties with a value of up to £150,000 and 2% on the next £150,000. This new tax regime on commercial stamp duty came into force on 17 March 2016. The Chancellor gave the example of a pub which will see stamp duty falling from £8,000 to £3,000 which highlights the potential significant reductions in tax for businesses looking to purchase another site. The introduction of the new apprenticeships levy will have a significant impact on the biggest care home operators up and down the country. Introduced in last year’s Autumn Statement, the apprenticeship levy will see care home groups with a payroll costs in excess of £3m contribute to the funding. The levy will come into force from April 2017. There were no additional details given about the new apprenticeship levy and how it will work in practice. There was hope from some care homes that the government would announce measures to support the sector ahead of the new National Living Wage, now less than 3 weeks away. There were no further announcements made.